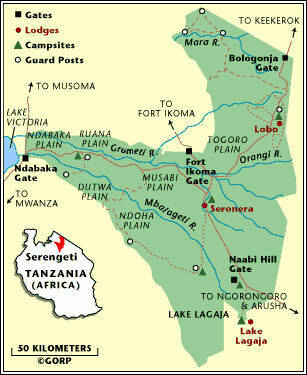 Tanzania, the largest country in East Africa, has a total area of 945,087 sq km or 364,900 sq miles including 59,050 sq km or 22,799 sq miles of inland water. Comparatively it is almost four times the size of the UK and twice the size of the State of California in the USA. Just south of the equator, it is bounded on the north by Uganda and Kenya, on the west by Zaire, Burundi and Rwanda, on the southwest by Zambia, on the south by Mozambique and Malawi and on the east by the Indian Ocean. 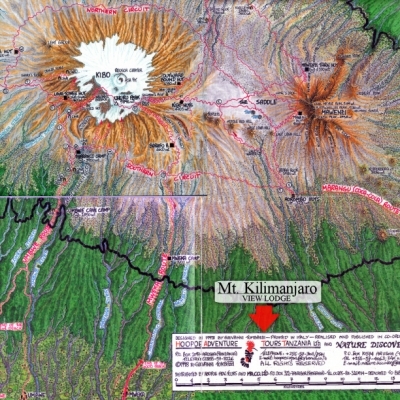 The boundary length is 4,826 km or 2,999 miles with 1,424 km or 885 miles as coastline. 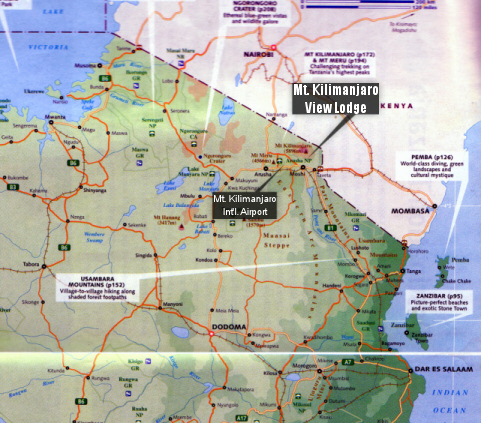 Arusha, considered the gateway for safaris, is 47 km or 29 miles to the west and Moshi, which is smaller but at the lowland base of Mount Kilimanjaro, is only 32 km or 20 miles east of the airport. 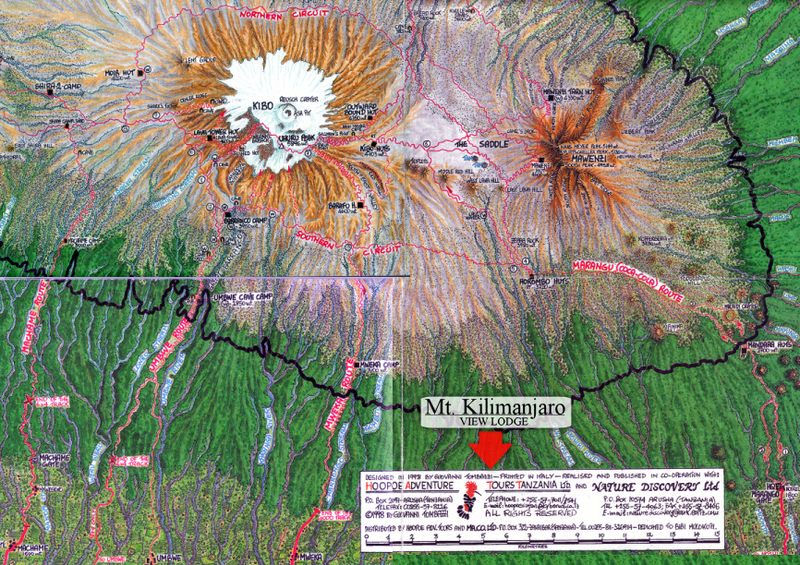 Mount Kilimanjaro View Lodge, which provides transportation from the "Kili" airport, is an additional 16 km or 10 miles north of Moshi on an unpaved road through Upper Shimbwe Village to a scenic remote perch 2,800 m or 9600 ft against the rain forest. 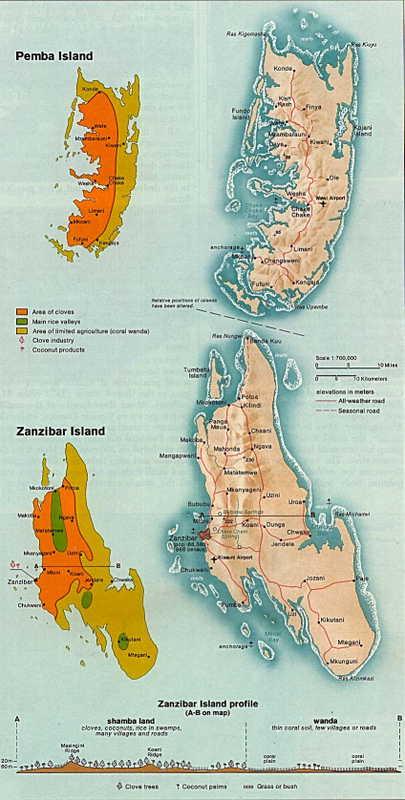 The section of the United Republic known as Zanzibar consists of the islands of Zanzibar and Pemba and all the tiny islands within 19 km or 12 miles of their coasts as well as uninhabited Latham Island which is 58 km or 36 miles off Zanzibar. Zanzibar Island is the largest and most popular island lying 35 km or 22 miles off the coast with an area of 1,657 sq km or 640 sq miles. Pemba Island, which is northeast, is 40 km or 25 miles from the coastline has an area of 984 sq km or 380 sq miles. Along the Indian Ocean coastline. the largest city of Tanzania, Dar es Salaam, with a population of 2,500,000,is 35km or 22 miles south from the famous island.